In the case you have around a thousand bucks to burn and you're looking for the coolest gadget to buy to impress your family during Thanksgiving dinner, look no further than the LG G Flex. This is the second device to come out with a curved display (the first being the Samsung Galaxy Round), which arcs from top to bottom and even offers a little bit of flex when you push down on it. Officially it's only available in Korea for 999,940 won (about $940), and while rumors are pointing to an eventual launch in other parts of the world, the earliest -- and richest -- of early adopters in the US can grab one from importers for around $1,100. One of those companies is Negri Electronics, which was gracious enough to send us a G Flex for a few days. Between the G Flex and the Galaxy Round, you're looking at two of the most expensive smartphones this side of a Vertu or Porsche Design BlackBerry. So what's the point? The benefits of curved or flexible displays are three-fold (so far): they promise more durable gadgets, a better viewing experience over regular phones and could potentially lead to wholly flexible devices or even brand new form factors (Samsung, for instance, is already working on a phone with a foldable screen, as well as a prototype with a bent display). It's pretty exciting stuff, so we've opened up the G Flex box, fired up the phone, and we're ready to share our initial impressions with you. 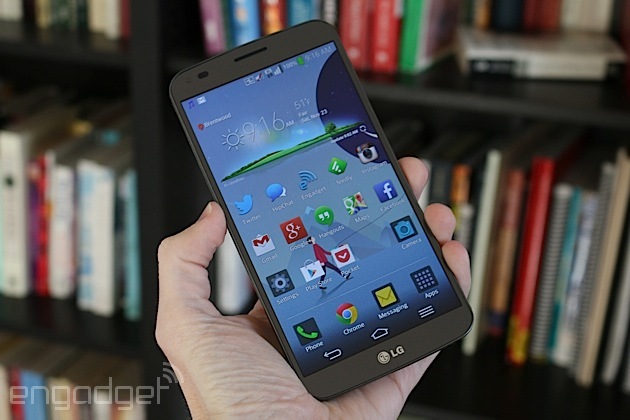 Take a closer look at the G Flex with our gallery and thoughts below. The G Flex has been referred to as "the banana phone" more than once, and that nickname would certainly fit the description. Compared to the Galaxy Round, which features a short contour from left to right, the Flex's three-dimension reach is far more noticeable because it arcs from top to bottom -- yes, exactly like the tropical treat. 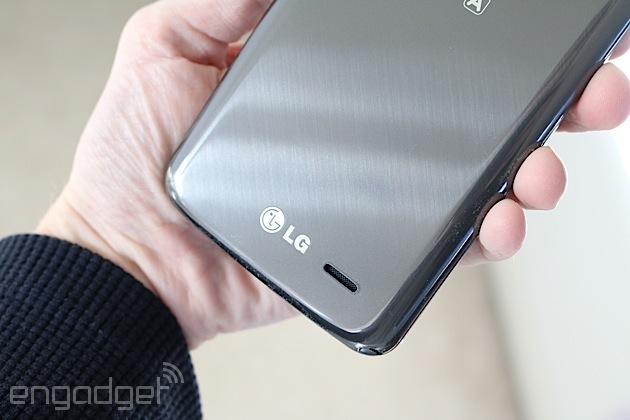 From a high-level view, it looks a lot like a large LG G2 that sagged in the middle, but as you might imagine, there's a lot more to it than that. First, let's dive into the display, which is a 6-inch, 720p Plastic OLED (POLED) panel with a pixel density of 245 ppi. While it's not as beautiful, bright or crisp as most 1080p screens, we weren't as disappointed with the lower resolution as we had initially expected. The colors aren't as saturated on the G Flex as they are on the G2, It's easy to read in direct sunlight and the curved screen helps make viewing angles even better than most phones we've used. Overall, however, the screen on the Round is of better quality, and we're confused by LG's decision to use a lower-resolution panel, especially given the phone's extremely high cost. The in-hand feel is another area in which the Galaxy Round bests the G Flex. It's larger in virtually every dimension (it's 0.8mm thicker, 9.4mm taller, 2mm wider and 23 grams heavier), which already makes it pretty uncomfortable, but the top-to-bottom arc also makes the phone feel more awkward to handle. The Round's left-to-right curvature, in contrast, gave it a much more natural fit in my hand. As many of you have already guessed, the G Flex also doesn't fit quite as comfortably in pants pockets -- again, largely due to the direction of the Flex's curve. That said, there's one area in which it does feel better than the Round: my face. It's reminiscent of older cordless telephones that wrap around the cheek and reach down to the mouth, and it feels like it's meant to be shaped that way. On paper, the G Flex gains an upper hand in durability over the Round despite its clear disadvantage in overall comfort; both devices offer a curved screen that theoretically lends to a more durable experience because it isn't quite as exposed to drops, and LG's version adds a self-healing finish on the back and the ability to actually flex under pressure. But how well does this translate into real-life use? As a disclaimer, we had to be more delicate with the phone than we would've preferred, because it was a temporary loan from Negri and we were specifically asked to keep it in good shape. Therefore, we couldn't try out the self-healing finish beyond the usual wear and tear (which it handled with ease), but we expect to receive another unit which we can fully test in the near future. A couple of our industry colleagues have had the opportunity to put the G Flex's durability to the test, however. A drop test on Android Authority shows that it's indeed possible to crack the screen when the phone's dropped on its end (although the phone itself still works well). Additionally, YouTube reviewer Marques Brownlee showed that minor scratches are minimalized -- though not completely erased -- thanks to the phone's self-healing capabilities, but you definitely don't want to use a knife or other extremely sharp object on it. Still, it's at least better than any other phone on the market, and we wouldn't be surprised if LG continues to make it even better. 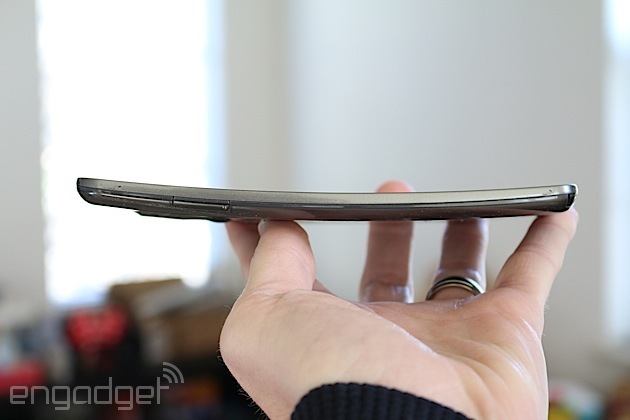 The last aspect of durability is the G Flex's ability to... well, flex. Unlike the Round, which features a flexible display that's bonded to a rigid and unmovable chassis, the G Flex can actually be flattened with enough force and is capable of springing back to its original shape. 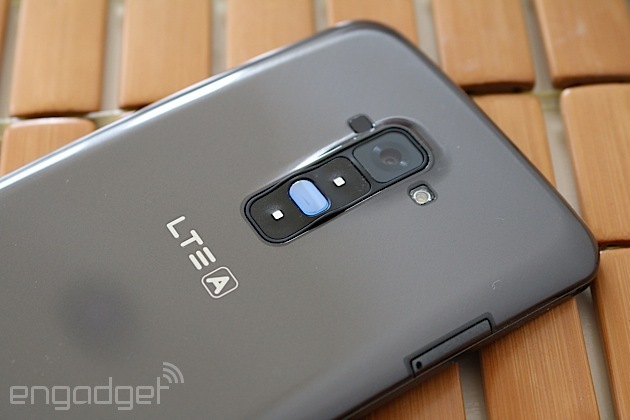 In theory, this extra flexibility can protect it from external impacts or pressure that normal phones may not be able to endure, and our real-life tests didn't give us any reason to doubt it. We can't say that it's worth paying a $300 premium for this feature, but as the tech continues to progress, the cost will go down and this could certainly become a solid selling point. We'll spend more time and go into more detail on the phone's performance once we do a full review, but the Snapdragon 800 chipset inside the G Flex does quite well. It's just as quick and capable as the G2, and we were quite happy with it. In fact, LG has thrown in a multi-window feature that takes advantage of the large screen, and it works without any hiccups. Gaming is good for the most part, save for the occasional frame skip here and there. The 3,500mAh battery inside the G Flex is also as good as it sounds; we were able to run a 720p video on endless loop for a little over 14 hours before the battery died. In the early stages of curved or flexible displays, there doesn't seem to be much of a point for people to buy into the idea... yet. Samsung and LG are just testing the waters, each company coming out with a brand new type of device that paves the way for a much more exciting smartphone future. As for the present, the improvements that curved phones have over their flat counterparts are rather minimal right now -- the extra value is certainly not significant enough for us to recommend that you spend $1,000 or more to get one -- but it's only going to get better with time and as more resources are dedicated to the movement. The G Flex and Round are pretty good for first-gen products, but for the moment, they're still a novelty.